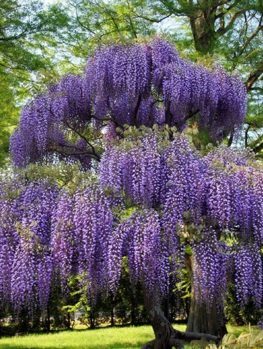 The Blue Moon Wisteria is a stunning climbing plant that has amazing lavender flowers in spring, with almost 100 flowers clustered in huge, foot-long hanging racemes. A plant in full-bloom is a remarkable garden feature. 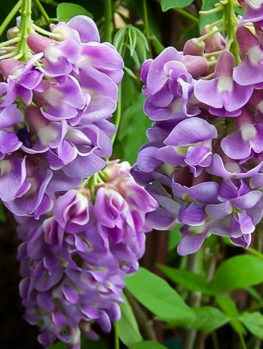 Unlike other kinds of wisteria, this plant is very hardy and will bloom even in the coldest states – in fact it usually blooms again in summer and often also in early fall, making it far superior to regular wisteria. It makes a large vine up to 25 feet long, so it should be grown on a strong pergola or arbor of a suitable size. The dark-green foliage is almost ferny in appearance and it makes an attractive plant, even when not blooming. 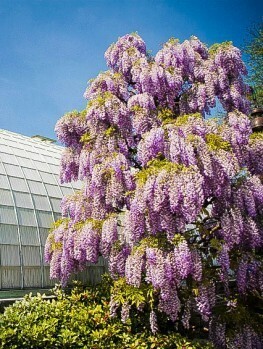 Plant the Blue Moon Wisteria in full sun at the foot of a sturdy structure for it to climb, or at the base of a tree. It will grow in any well-drained garden soil and once established it has some drought-resistance but it should be watered well during hot, dry spells. Pruning is necessary to control the growth and keep your plant looking beautiful. Since young plants take several years to bloom it is important to plant a more mature specimen, to get blooms more quickly. Wisteria is undoubtedly the ‘Queen of Vines’, and a well-grown plant in full-bloom is a sight not easily forgotten. Regular wisteria vines are not particularly hardy, and can be difficult to train because they are such rampant growers, but one, the Blue Moon Wisteria, is a gift to growers in cold areas. This vine will bloom even with winter temperatures of minus 40 degrees, and it is less aggressive, so it is easier to train. The Blue Moon Wisteria is a true American Queen, growing naturally in the southern states and growing naturally as far north as Illinois. 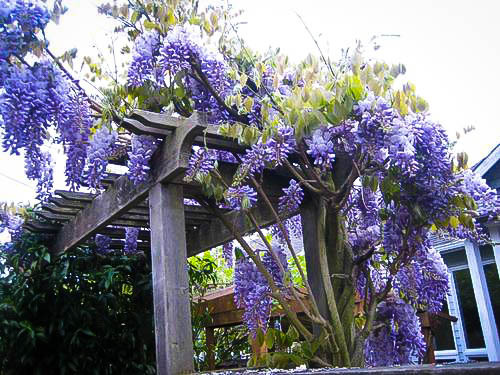 This native plant is related to the more common Chinese wisteria, but is much superior if you live in a cooler area. Because Wisteria takes several years to bloom from a young plant, it is important to start with a mature plant. An older plant like this will normally bloom the first year after planting, giving you an early taste of how beautiful it is going to be. While the Chinese wisteria just blooms in spring, the Blue Moon Wisteria often blooms three times a year – a major blooming in spring before the leaves emerge, followed by additional blooms in summer and often again in early fall. 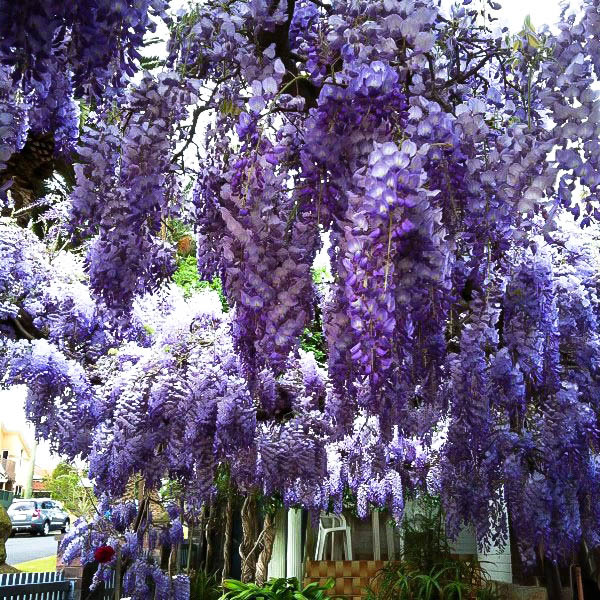 The blossoms are magnificent – lavender blue in color, and clustered on a hanging raceme that is 12 inches long. There can be as many as 90 individual blooms in each raceme and a plant can be covered in hundreds of these flower clusters, creating a stunning and dramatic effect in the garden. The foliage is dark green and the leaves are up to 12 inches long, divided into smaller leaflets, with between 9 and 15 leaflets per leaf. The Blue Moon Wisteria (Wisteria frutescens var. macrostachys) is a native American vine that will grow to about 25 feet tall, or cover a similar area on a pergola. It is self-twining, meaning it doesn’t need complex tying and it will also climb into a large tree, which is its natural pattern of growth. If you have a large dead tree to deal with, this could be an interesting way of covering it and making it into a thing of beauty. It will also grow well on a pergola or arbor, but it should be well-built and sturdy, as a fully grown plant is heavy and needs strong support. Plant your Blue Moon Wisteria beside one of the upright supports of your arbor and train it upwards so that it will spread across, providing a beautiful floral display as well as welcome shade in hot weather. 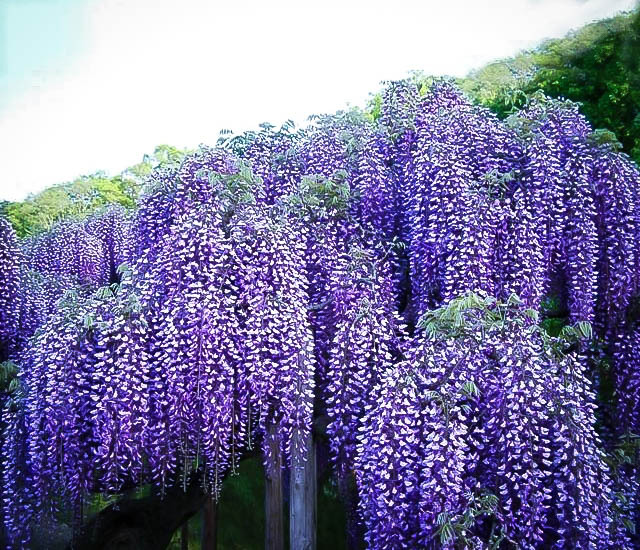 This special form of Wisteria can only be grown by taking pieces from top-quality plants of the correct type and it take several years to produce these tall, mature, staked plants. So avoid other types of Wisteria, especially cheaper plants grown from seed, as they will take years to bloom and will not be as hardy or as beautiful as the true Blue Moon Wisteria. 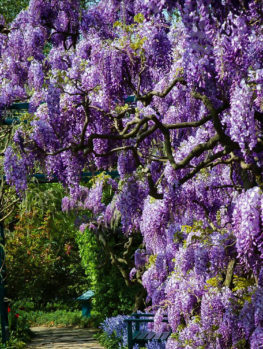 Although the Blue Moon Wisteria grows naturally in the south, it is hardy throughout the country, even into zone 3, with winter temperatures of minus 40. If you have tried to grow a regular Chinese wisteria in a cold area and never had blooms, then the Blue Moon Wisteria is for you. It will bloom well even in the coldest areas. It will grow in most well-drained garden soils but does need water during hot, dry spells. It should be planted in full sun for maximum bloom, and it has no significant pests or diseases. To control the growth and encourage flowering, you should prune twice a year. The first pruning takes place in fall, when you should cut back the branches to the large buds, which are the ones that will produce flowers. Remove any long, thin, straggling shoots. Then again in summer, cut back new long shoots not needed to increase the size of the plant, leaving about 6 inches of new stem. Always cut just above a leaf or bud. This particular hardy variety is not often available, so to enjoy the beauty of the Queen of Vines, no matter where you live, order now to avoid disappointment.